As you migrate into a Digital Earth, you choose the life you live, and make it the one you want. Now that most of our waking hours are spent using screens we’re visibly migrating to a Digital Earth. Like other immigrants we want and expect better lives. New Digital Boundaries will let us step through the looking glass, control what’s on our screens and construct the digital lives we want — in a digital world that eliminates today’s limits. As tomorrow’s digital world gives you more control, what kind of life will you want? America is often described as a land of immigrants, people whose ancestors came here to build a better life. That’s becoming yesterday’s story. Today we’re transforming. We’re turning into a land of emigrants, filled with people who are leaving the physical world as we migrate into a new digital world. Welcome to our digital migration. Today is turning into tomorrow, and tomorrow into today. 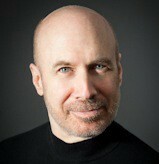 We’re walking and driving through the physical world while we spend the majority of our waking time with screens. If we’re migrating and starting to live on-screen, how will that work? How will we build a better life? 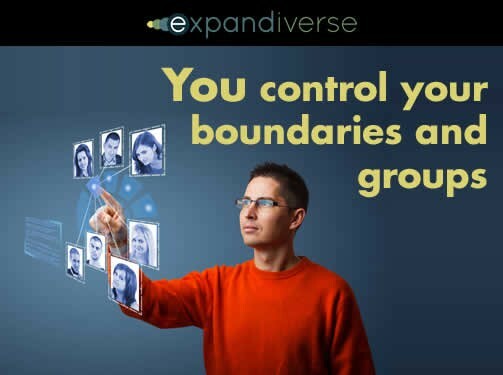 Expandiverse Technology adds boundaries that each person and group can control. What would you let in and what’s out? How much protection makes you feel safe? Would you like to be paid for your attention by advertisers? The power to filter messages is the power to run your digital world, with you in control. This tech gives you control so you may end up liking your digital, on-screen world more than the physical one — by choice and by where you spend most of your time. Let’s hope the physical world doesn’t sulk too much. In today’s physical world, people are surrounded by invisible boundaries between them and others. Companies are surrounded by both physical and relationship boundaries. Public spaces have their own implicit and explicit limits. Only governments have visible boundaries — their physical borders with passports and inspections when you enter and leave a country. In the future we will expand beyond those physical borders and evolve continuous online connections to people, companies and services worldwide. As our digital migration advances, our boundaries can become explicit and visible. 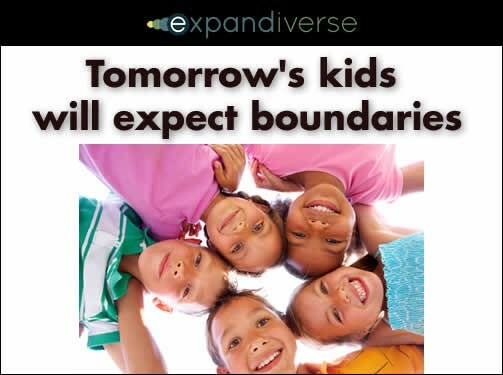 New types of Expandiverse boundaries can provide security and other actions based on each of our choices, interests, goals and activities. What are these boundaries and how do they help people? One of these boundaries is security / safety, so let’s start with this basic need. In a digital world, personal security boundaries will become normal. In fact, personal security could become a larger and more valuable digital industry than the physical world’s security industry. Part of physical digital protection will be identifying and responding to those entering a physical location. Part of online digital protection will be identifying and responding to those with whom we connect through our screens. We’re migrating into a known world, where our boundaries identify who and what is around us, so we know our level of safety and can respond appropriately. 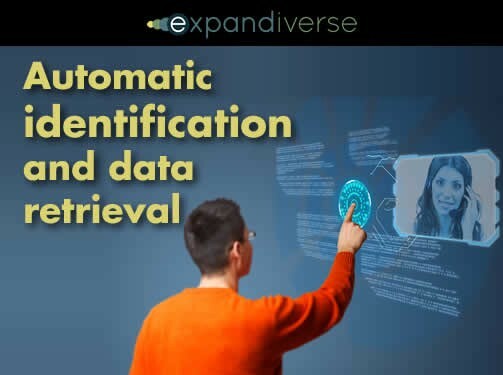 Automatic identification will include retrieving data on people, and responding based on your choices. It will be more than remembering people’s names so you won’t embarrass yourself when you greet someone you should remember. When identification is normal personal security will become part of our everyday lives. That will alter how we relate to new people and trust them, because most people everywhere are good people. Today’s version of this is the security monitoring centers provided by the security industry. Just like companies and governments install security monitoring centers to know they’re safe and provide alerts for issues, in the future people could have digital monitoring to see they’re secure. Boundaries will come in various sizes. Boundaries with small group sizes will use “white lists” to permit rapid responses to a short list of approved people, companies and services. Imagine your home’s front door. Very few people need to be on it’s “white list” so they can enter automatically. With such a short list, recognition can be instant and accurate — while everyone else is dealt with as an unknown person. Larger and more open boundaries will use a combination of white lists, identification / recognition, and black lists to offer us choices based on people, places, relationships and contexts. But digital boundaries can do much more than security. We could use them to live well, in the ways we want. Initial boundary steps: Identification and data retrieval. Subsequent steps: Based on who is identified, and what is learned about them. Valuation: Value those identified based on your choices, preferences, interests, goals, etc. Prioritizing / Alerting: Focus on who and what is valued most; may include actions such as acceptance, invitation, permissions, responses, scheduling, recommended steps, automatic steps, etc. Paywalls: Revenue generation by blocking commercial parties with access allowed based on your interests, permissions, customer relationships or their paying you. Categorizing: Treatment, scheduling, alerting, routing, etc. based on your categories. Filtering: Custom displays based on your priorities, value, categories, paywall, connections, blocks, etc. to see the world you want on-screen. Blocking / Protection: Online blocking, removal or protection based on the filters you choose. Security: Alerts or active protection based on any of the above criteria, plus steps to deal with possible safety risks, potential danger, etc. Personal boundaries: Family, friends, employers, groups, affiliations, etc. Business / corporate boundaries: Customers, prospects, employees, contractors, partners, suppliers, distributors, vendors, etc. Semi-public and public spaces boundaries: As people enter physical places like stores, malls, hotels, airports; or online activities like digital events, conferences, meetings, etc. Business (see the next chapter): Continuous customer and prospect relationships, supplier and partner relationships, distribution and delivery relationships, paywalls, security, etc. Commercial physical / online: Identify and respond to individuals in both physical locations and online. Personal digital: Revenue-generating paywalls; boundaries based on identity, privacy, filtering, security, etc. Governments / Military: Boundary monitoring and responses in both physical locations and online; systems to penetrate others’ boundaries; etc. Our digital migration has begun. Most people in today’s world are already good people who deserve respected, proud and happy lives. As we emigrate into tomorrow’s digital world our digital boundaries will give us personal security and much more. With self-controlled boundaries we will turn our screens into a looking glass that shows us what we want: Our security boundaries will identify and describe the people, companies and services around us physically and digitally. Our valuation and categorization boundaries will tell us their value and how we might respond. Our filter boundaries will let us include what we like and exclude what we dislike. Our paywall boundaries will block out companies that want commercial access to us, except when we have a relationship with them, or because they pay us. We will see that we’re surrounded by good, hard working people everywhere around the world. 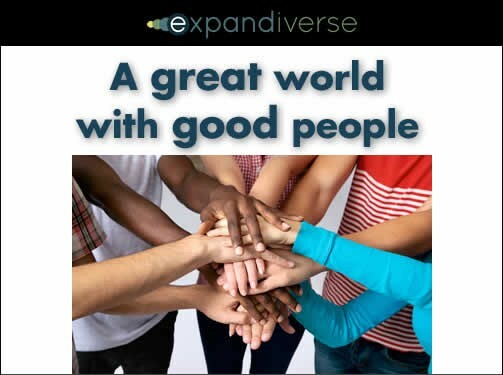 Diversity and inclusion will grow as we become friends with many kinds of trustworthy, sincere people. We will experience liking many kinds of people because our boundaries will show us there are many people who have a good life in their own ways. We will be much less likely to reject others because we don’t understand them. As boundaries become commonplace we will learn how to construct and share good spaces in which we and others can live well. We will individually and collectively step through our looking glasses into the lives we want. Then we will stay in the ones we like and enjoy, and adjust our boundaries until we build what we want. We’ll live online in the ways we choose, experiencing who we dream of becoming instead of receiving our identities from top-down institutions. We’ll be supported by the companies, services and communities that want us to have dreams, reach for them and live them. As we grow together we will approach the threshold of being the creators of tomorrow’s digital world. We could choose to live in a digital world where our dreams can come true, expanding today’s limits to include the possibilities and opportunities we would like. That worldwide “civil society” would be helpful for our mid-century planet of nine billion people, all of whom will want prosperity and success. We will find many huge tech, business and personal growth opportunities as we emigrate into a self-controlled digital world. With our large needs for safety and so much more, digital boundaries could turn into some of the world’s most valuable advances — for people, as well as for companies that serve their customers well. Good people deserve to control their own lives — and Expandiverse digital boundaries are designed to provide that. As you gain control, what kind of life will you want? Next Chapter: When and how will you win? When tech upgrades the economy. You will enjoy personal Digital Earths that serve you, with anything you want.